Research can be a powerful tool for Special Olympics Programs interested in sharing the impact of their programming, encouraging others to get engaged, securing partnerships, informing legislative bodies and creating evidence-based programming. Discover more and share with your community. Please note: For the best user experience download Google Chrome as your web browser. Google Chrome allows for the use of anchors to instantly jump to sections as you select them. Other browsers will not allow this functionality, making it more difficult to find information. Special Olympics is a leader in the field of people with intellectual disabilities and research. Use this document to increase awareness of how Special Olympics leads to change at the individual, community and societal levels. Complete Research Overview Tool: Download Special Olympics research information in a designed-to-print, 50+-page file that covers attitudes, sports, Unified Sports, health, Unified Strategy, Young Athletes, families, demographics, brand and Program evaluation. Attitudes Research - Overview: This designed-to-print six-page overview of our attitudes research includes sections on the why we research attitudes, public attitudes toward people with ID, changing attitudes through Special Olympics, and key findings, and also includes citations and charts. Overall Impact & Sports Research Overview: This designed-to-print, four-page overview of our sports research includes sections on why we research sports, the impact on involvement on athletes and families, World Games, and key findings. These resources can be used by Program team members to educate others on why and how Special Olympics changes attitudes. This is at the crux of the Special Olympics movement and a focus area in the 2016-2020 Strategic Plan. Best Stats for Attitudes: This one-pager provides the most compelling data points about Special Olympics attitudes in easy-to-use bullet points and infographics. Why Research Attitudes: Attitude change is at the crux of the Special Olympics movement. Read this short overview to help explain why it's so important that Special Olympics research attitudes. Public Attitudes Toward People with Intellectual Disabilities: Due to the impact that public attitudes have on the lives of people with ID, documenting these attitudes has been one of the cornerstones of Special Olympics research. Since 2001, surveys of public attitudes have been conducted in 14 countries representing all Special Olympics regions. Discover more in this summary of several studies. Attitudes - Key Findings Image: Download a jpeg of the key findings and associated sources. Public’s perceptions of the abilities of people with intellectual disabilities: Special Olympic’ multinational attitudes study surveyed people from 10 countries around the world to assess their attitudes about people with ID. Impact of the Special Olympics World Games on the Attitudes of Youth in China: Read more on the study about middle school students pre- and post-World Games in 2007. It is clear from the results that World Games left a positive impression on many of the youth, with the most significant changes among the youth who had the opportunity to be directly involved in the Games. Multinational Study of Attitudes toward Individuals with ID: Read the first study of "hard" evidence examining attitudes toward people with ID around the world. The study was conducted in 10 countries across the world, with 8,000 persons responding. Overall, the survey shows that the general population lacks an appreciation of the range of capabilities of individuals with intellectual disabilities, and therefore has low expectations of how much people with ID can achieve. Changing Attitudes Changing the World - A Study of Youth Attitudes about Intellectual Disabilities: Read more on this groundbreaking study of how Japanese youth view individuals with ID that helps begin to demonstrate attitudes concerning individuals with ID. This study supplements findings on the attitudes of Japanese adults in a survey commissioned by Special Olympics and released in 2003. While widespread negative attitudes toward people with ID exist throughout Japan (and worldwide), the youth population is more receptive to potential interaction with people with ID in the school setting and is the best source of encouraging positive attitudinal change. Sports is at the foundation of the Special Olympics movement. Use these resources to share more about the impact of sports. Best Stats for Sports: This one pager provides the most compelling data points about Special Olympics Sports in easy-to-use bullet points and infographics. Why Research Sports: As an organization that seeks to empower people with ID to achieve their personal best in all aspects of life, Special Olympics provides an opportunity for people with ID to demonstrate excellence, improve their physical fitness, and create relationships through sports. Impact of Sports Involvement: Special Olympics studies have shown that participating in Special Olympics sports has a positive impact on athletes and families in a variety of ways. Discover more about the impact of sport. Chinese Youth Willingness to Interact with Students with ID: Youth in China who were surveyed before and after the 2007 World Games reported important increases in reporting a willingness to talk to a student with a disability during free time (up 8%) and willing to work together on a class project (up 9%). Family Perception of Athlete Improvement: Family members in Latin America perceived a great deal of improvement in athletes' sport skills, health and social relationships, among others. Overall Impact and Sports Research Key Findings Image: Download a jpeg of the key findings and associated sources. The 2011 Summer World Games Experience for Special Olympics Athletes and Coaches: This trans-national, longitudinal study of coaching was the first of its kind in Special Olympics and focused on Costa Rica, Greece, India and South Africa. A comprehensive national study of Special Olympics programs in China: This impact study evaluated Programs in each of the 31 Chinese provinces and found many athletes became involved through schools, athletes are serious in their endeavor to be physically fit and much more. A comprehensive national study of Special Olympics programs in Latin America: This study was designed to provide Special Olympics with a comprehensive view of athletes and their families, as well as begin to document the Latin American athlete’s Special Olympics experience. The findings include results from Argentina, Brazil and Peru. Special Olympics is activating people to #PlayUnified in order to live unified. Share these resources demonstrating the many impacts of Unified Sports. Best Stats for Unified Sports: This one-pager provides the most compelling data points about Special Olympics Unified Sports in easy-to-use bullet points and infographics. Why Research Unified Sports: Unified Sports provides people with and without ID the opportunity to play on the same sports team, creating a space for friendships, physical activity, and fun. Research on Unified Sports has found that Unified Sports athletes experience improved social competence and social inclusion while decreasing problem behaviors. Creating Inclusive Communities: By consistently challenging the negative perceptions of people with ID and demonstrating their capabilities, Unified Sports creates “bridges to social inclusion” in the community. Unified Sports as A Bridge to Social Inclusion Graph: Working in five countries, this evaluation carried out more than 200 qualitative interviews and gathered data on 55 Unified teams that showed a complex and positive relationship that Unified Sports had on participating youth, the organization involved and interaction with the local community. Unified Sports - Athlete and Partner Effort Graph: Use this graphic to illustrate the athlete and Unified partner effort during competition reported. The similarities are striking. Unified Sports Research - Partner Gains in Understanding People with ID Graph: Use this graphic to show how the vast majority of Unified partners have reported their understanding of people with ID has changed a lot (51%) or a little (31%) since becoming involved with Special Olympics Unified Sports. Final Report, Unified Sports: An evaluation of Special Olympics Youth Unified Sports® Program in Europe-Eurasia. McCarey: Unified Sports (DOCX): Research that supports how Unified Sports can educationally, socially and physically benefit students with and without intellectual disabilities in schools. Unified Sports in U.S. school settings: Unified Sports is the fastest growing program in the Special Olympics movement, with 704,230 participants world-wide in 2013, and there is a wealth of evidence about its effectiveness but knowledge gaps still exist. Unified gives us a chance: An evaluation of Special Olympics youth unified sports programme in Europe/Eurasia: Working in five countries, this evaluation carried out more than 200 qualitative interviews and gathered data on 55 Unified teams that showed a complex and positive relationship that Unified Sports had on participating youth, the organization involved and interaction with the local community. National (U.S.) evaluation of the Special Olympics Unified Sports program. A special report. : The purpose of this United States evaluation was to analyze the perceptions of key stakeholders (state directors, athletes, family members, partners, and coaches) regarding their commitment to the concept of Unified Sports, and their overall satisfaction with the Unified Sports Programs. These resources show the disparities people with intellectual disabilities face in wellness and access to health care, and the positive impact Special Olympics is having on these issues. 2018 Healthy Athletes Prevalence Report: This prevalence report outlines key findings from 2017 Healthy Athletes Screenings around the world. 2018 Prevalence Report Overview: This two page document highlights key information from the 2017 Healthy Athletes screenings of Special Olympics athletes. Best Stats for Health: This one-pager provides the most compelling data points about Special Olympics health programming in easy-to-use bullet points and infographics. Regional Data Table: Use this graphic to show the findings of Healthy Athletes exams in your Region. Across Regions, the health issues experienced by people with ID are evident. Global Chart: This interactive chart illustrates some of the alarming global findings of Healthy Athletes. It is customizable by Program. Information on Health Issues for People with ID Compared to the General Population: This data table shows the disparities between the population of people with ID and the general population for several health indicators. Results from Programs doing the Healthy Communities Pilot - Year 1: This 22-page document highlights data, impact stories, continued progress and lessons learned from Special Olympics Programs participating in the Healthy Communities pilot. Results from Programs doing the Healthy Communities Pilot - Year 2: This brief PowerPoint shares the metrics reported by the Special Olympics Programs participating in Healthy Communities through 1/31/15. Results from Programs doing the Healthy Communities Pilot - Year 3 Mid-Year: This chart includes metrics from the 14 Special Olympics Programs piloting Healthy Communities and includes information gathered August 1, 2012 through January 31, 2015. Curriculum Assessment of Needs: Despite 85% of people with intellectual disabilities being only mildly impaired, there is a widespread belief that people with ID are not capable of doing things such as playing inclusive sports and attending inclusive schools. The antecedents and impacts of Healthy Athletes: The antecedents and impacts of participation in Special Olympics Healthy Athletes on the perceptions and professional practice of health care professionals: A preliminary investigation. Did you know that after participating in Healthy Athletes, 72.7% of healthcare professional volunteers said that they would seek more patients with ID? Learn more in this research article. The Health Status and Needs of Individuals with ID: Visit the overview and the complete study from 2000 that examines the physical, ocular, mental and dental health needs of individuals with ID. Additionally, the health care services available and accessible to this population are discussed. The report concludes with a list of recommendations, proposed to improve the health of individuals with ID. Learn and share how Special Olympics is working toward communities where students with disabilities feel welcome and are routinely included in all school activities, opportunities and functions leading to long-term societal change. Best Stats for Unified Champion Schools: Best Stats for Unified Champion Schools This one-pager provides the most compelling data points about Special Olympics Unified Champion Schools programming in easy-to-use bullet points and infographics. 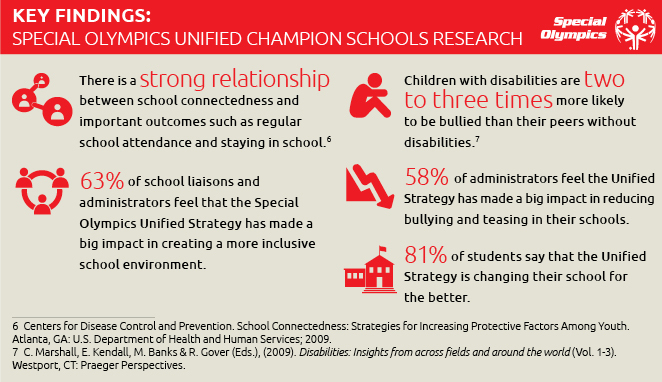 Why Research Unified Champion Schools: Children with disabilities are two to three times more likely to be bullied than their peers without disabilities, and research demonstrates a clear need to promote an inclusive school environment for people with ID. Impact on Students: As of 2014, more than 3,000 elementary, middle and high schools across 45 states are employing the Unified Strategy and as many as 1.7 million youth are engaged. Unified Champion Schools Staff Members' Perceptions: This interactive chart illustrates the staff of Unified Champion Schools' perceptions after joining the Special Olympics movement. Unified Champion Schools Key Findings Image: Download a jpeg of the key findings and associated sources. Project UNIFY Year 6 report (2013-2014): This 92-page report by the University of Massachusetts Boston highlights the Project UNIFY program since it began. Data and lessons learned are shared for the past six years, such as, students involved in all three components of Project UNIFY gain the most from their involvement in terms of personal growth, attitudes toward classroom inclusion, and perceptions of their school’s social inclusion. Project UNIFY Year 5 report (2012-2013): This 49-page report by the University of Massachusetts Boston highlights the Project UNIFY program in 2012-13 and was submitted to the U.S. Department of Education. Project UNIFY Youth-led Research Project: Technical Report: Special Olympics, Inc. partnered with Special Olympics Maryland and public school students to pilot youth-led research methods that model our values, including respect, dignity, and self determination. Employ the research conducted on the Special Olympics Young Athletes program, which engages children with ID between the ages of 2 and 7 in a sport and play program with a focus on motor skills development. Best Stats for Young Athletes: This one-pager provides the most compelling data points about Special Olympics Young Athletes programming in easy-to-use bullet points and infographics. 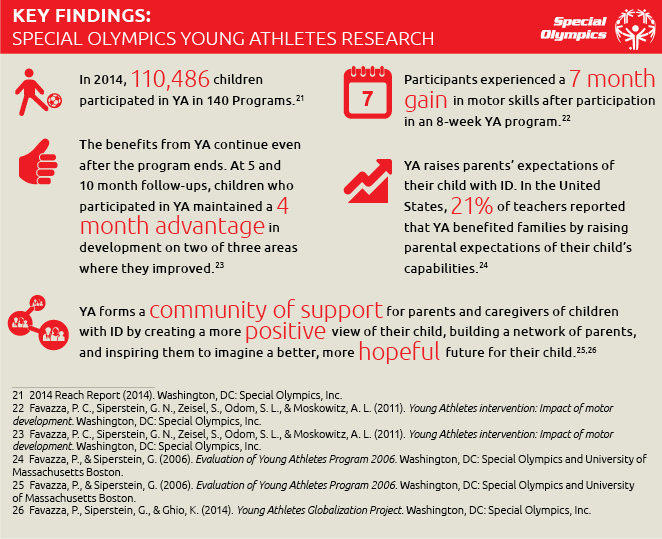 Why Research Young Athletes: The Young Athletes program began in 2007 and the research already is showing how Young Athletes benefits the participating child and the family. Impact on Participants: Research conducted by Special Olympics and its partners has found that Young Athletes improves the motor skills of participants. Benefits for Children with ID Graph: View this graph that illustrates how children participating in Young Athletes experienced a seven-month gain in motor skills as well as a four-month advantage in development at a follow-up appointment. Impact of Young Athletes at the Individual, Family and Community Level: This interactive graph shows how Young Athletes impacts the individual, family and community. Evaluation of Young Athletes Program 2006: Findings in Azerbaijan, Chile, Israel, Panama, Paraguay, Romania, United States and Venezuela indicate that Young Athletes has a significant impact on both the young people who participate and their parents, sometimes in unintended ways. Young Athletes Intervention: Impact of motor development: This 2011 study found that children who participated in Young Athletes exhibited mean gains of 7 - 9 months on Peabody Developmental Motor Scale subscales compared to mean gains of 3 - 5 months in the control group. Young Athletes Globalization Project: Final Report: Findings released in 2014 from Kenya, Tanzania, Venezuela and Romania show that, similar to the results from earlier U.S. studies, children participating in Young Athletes experienced significant improvements in motor skills. 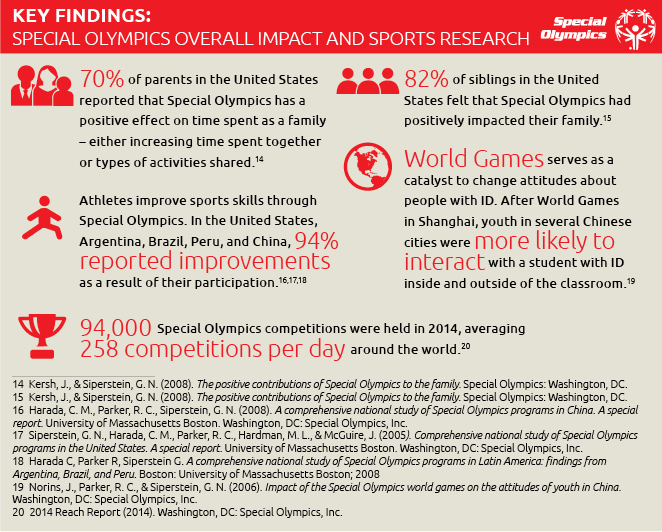 Families are essential to the Special Olympics movement, and share the research that shows how Special Olympics positively contributes to family members of athletes, too. 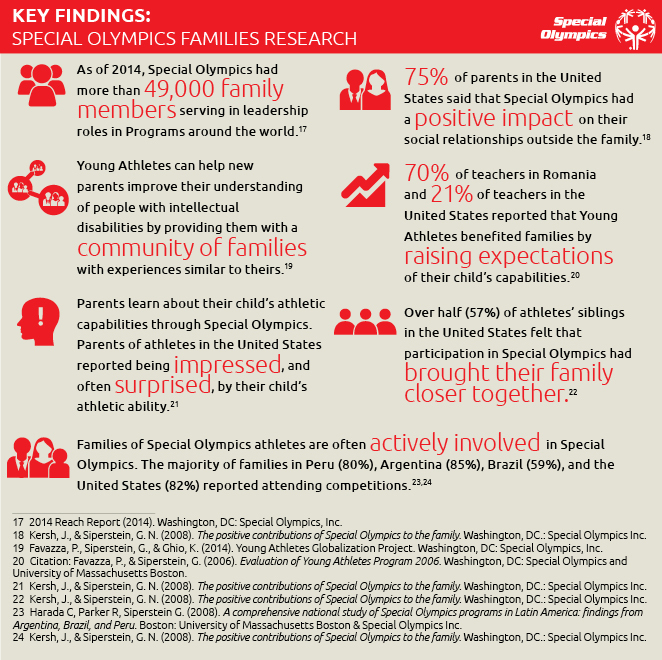 Best Stats for Families: This one pager provides the most compelling data points about Special Olympics families in easy-to-use bullet points and infographics. Why Research Families: Families are an important source of support for people with intellectual disabilities, many of whom continue to live with their families into adulthood. Benefits of Special Olympics to the Family: Evaluations have found that Special Olympics creates family networks, strengthens family relationships, raises expectations and builds knowledge. Families Key Findings Image: Download a jpeg of the key findings and associated sources. The Positive Contributions of Special Olympics to the Family: Findings from this qualitative study can be used to draw two conclusions: Special Olympics connects families and builds networks, as well as the organization provides athletes and families with normative life experiences that are critical to healthy development. 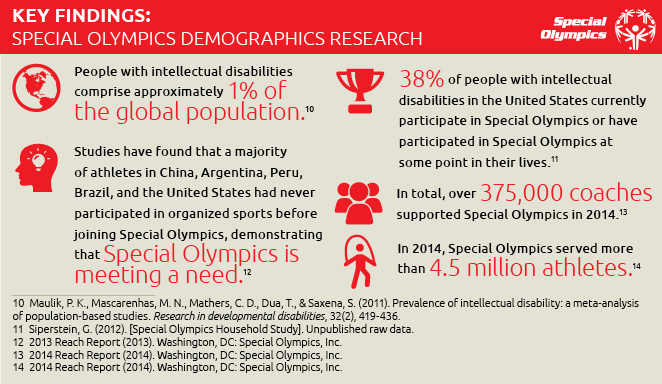 Best Stats for Demographics: This one-pager provides the most compelling data points about Special Olympics demographics in easy-to-use bullet points and infographics. Why Research People with Intellectual Disabilities: Little is known about people with ID. Oftentimes, national monitoring systems provide basic information on different populations. Yet, a study assessing 131 monitoring systems of 12 countries around the world found that less than 25% of these systems tracked people with ID. Who Are Our Athletes? : In 2003, Special Olympics served 1.3 million athletes, ten years later in 2013, that number rose to 4.4 million athletes. While there is no "typical" Special Olympics athlete, this section provides more information on regional involvement, ages and reported sports background of Special Olympics athletes. Historical Numbers of Athletes: 2000 – 2013: Special Olympics' growth rate from 2000-2013 is documented in this chart. In 2000, 985,973 athletes were recorded, with an increase to more than 4.4 million athletes by 2013. Demographics Key Findings: Download a jpeg of the key findings and associated sources. United States Athlete Demographics: This four-page feature highlights the demographic information for Special Olympics athletes in the U.S. and others with intellectual disabilities as reported as part of a Gallup-conducted survey beginning in 2011. Contains all the brand research resources. Brand Overview: Learn and share more information on Special Olympics' brand and corporate partnering. Why Research Brand: Special Olympics is among the most well-known and well-respected brands in the United States, with familiarity and favorability ratings on par or even exceeding the most prolific brands. Brand Key Findings Image: Download a jpeg of the key findings and associated sources. These resources are designed to aid Special Olympics Programs conducting research and evaluation. What is Research and Evaluation? : The collection of information or data lies at the core of both research and evaluation but differ in their goals and cover a wide range of activities. Why Do Research and Evaluation in Your Program? : Special Olympics Programs conduct research and evaluation in order to improve, to prove and to advocate. Getting Started Doing Research and Evaluation: While many hope to implement research and evaluation plans, sometimes it's hard to know where to start so this resource focuses on some steps and resources to aid interested Programs. Participatory Action Research Overview: Discover more about Participatory Action Research, which is when people who would typically be seen as the subjects of research become full or partial participants in the research process. Share Your Findings with the Special Olympics Movement: Share information with the movement about what you have learned in your Program through research and/or evaluation in order to help others benefit.